When Marc' Anthony Smith first tasted his granddad's amazing homemade biscuits he had no idea he would one day become an accomplished chef. He and his brother Michael would enjoy the warm, delicious offerings from their grandparents' kitchen, and marvel over the groceries they brought in and packed into the deep freezers on Sunday mornings. Smith was only eight at the time. How could he know that one day he'd be cooking for presidential candidates, catering events like The Masters or designing menus for Fortune 500 companies and professional sports teams? All he knew then was those biscuits were damn good. Smith's grandfather was a military chef who used simple, clean methods in the kitchen and instilled structure within his family. He always cooked everything from scratch — and always with love. Today, Chef Smith continues the tradition his granddad started but incorporates his own formal training, fresh, modern ingredients and super-creative presentation. He's living and working in Charlotte while attracting clients across the country with his flavorful offerings. CL caught up with him for a taste of his culinary expertise. Creative Loafing: Your grandfather was a big influence, but when did you actually decide you wanted to train in culinary arts and what prompted your decision? 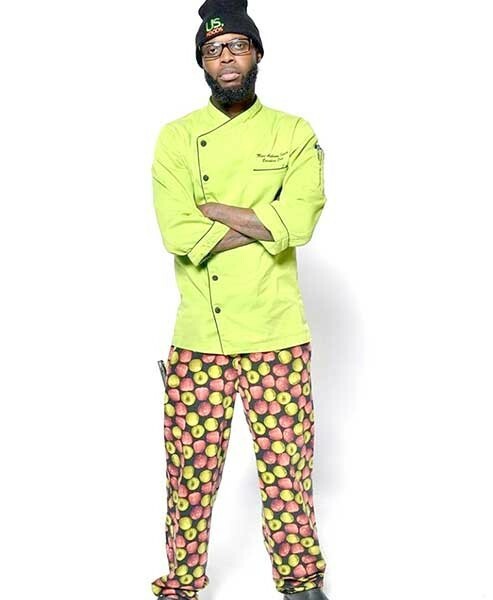 Marc' Anthony Smith: I knew I had to become a chef when I had my daughter Mariyah and son Javion in the same year. I was only 18 at the time, so yeah, it became pretty clear that I had to make a decision to get off the block and really start cooking. The birth of my children forced me to focus and from there it was on. I trained at Bank of America Corporate, cooking for their executives and partners, and while I was there I learned a lot, including several sauces, cutting techniques and grades of protein. I worked my way up to sous chef before being offered an executive chef position with Esposito's Italian where I designed menus for their three locations and continued to refine my skills. Tell us about some of your most memorable catering experiences? Well the biggest event I've done so far was the Masters. I call it my best, worst mistake. (Laughs) That was 3,000 people for seven straight days, which was crazy, but so rewarding. I've also cooked for the Carolina Panthers, New York Knicks, Hillary Clinton and Donald Trump during the recent presidential race. It feels really good to have served amazing food at that level, but I know I still want to challenge myself to do more. What is the worst thing a chef can do in the kitchen and what's your best tip? The worst thing a chef can do is serve food they know isn't right. I'd rather have the person wait for the correct dish than give them something horrible. Best tip is watch your fingers! (Laughs) No, but seriously, if you want to be a chef just create your own style and run with it.